The University of Maine at Presque Isle will present Mark Shepard—the CEO of Forest Agriculture Enterprises, award-winning author of Restoration Agriculture: Real-World Permaculture for Farmers, and proponent of sustainable agriculture—as the next speaker in its 2018-2019 Distinguished Lecturer Series. Shepard will deliver his talk on Restoration Agriculture on Wednesday, Oct. 3 at 7 p.m. in the Campus Center. The event is free and the public is invited to attend. During his talk, Shepard will explain how growers can create agricultural systems that imitate nature while still providing food, fuel, and other material needs. Shepard has been a farmer member of the Organic Valley cooperative, the world’s largest Organic Farmer’s marketing co-op, since 1995. He is most widely known as the founder of New Forest Farm, the 106-acre perennial agricultural savanna considered by many to be one of the most ambitious sustainable agriculture projects in the United States. Based in Wisconsin, New Forest Farm is a planned conversion of a typical row-crops grain farm into a commercial-scale, perennial agricultural ecosystem using oak savanna, successional brushland and eastern woodlands as the ecological models. At New Forest Farm, trees, shrubs, vines, canes, perennial plants and fungi are planted in association with one another to produce food for humans and animals, fuel, medicines, and beauty. Hazelnuts, chestnuts, walnuts and various fruits are the primary crops, though walnuts, hickories, pine nuts and pears, together with cherry trees, asparagus, and winter squash are also grown. Cattle, pig, lambs, turkeys and chickens also roam on the restored savannahs, and Shepard offers tours, practical workshops, and permaculture design courses. The farm is entirely solar and wind powered and farm equipment is capable of being powered with locally produced biofuels. Shepard and his wife Jen founded New Forest Farm in 1994. Trained in both mechanical engineering and ecology, Shepard has developed and patented equipment and processes for the cultivation, harvesting, and processing of forest derived agricultural products for human foods and bio fuels production. He was certified as a Permaculture designer in 1993 and received his Diploma of Permaculture design from Bill Mollison, the founder of the international Permaculture movement. 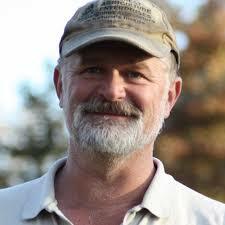 He teaches agroforestry and Permaculture worldwide. For more information about Shepard and the work he does with Forest Agriculture Enterprises, visit www.forestag.com; to learn more about New Forest Farm, visit www.newforestfarm.us. All are invited to attend Shepard’s Oct. 3 talk. For more information about this event, contact the University’s Community and Media Relations Office at 207-768-9452 or email umpi@maine.edu.